For a brief moment on Thursday, that nonpartisan "collegiality" that old-time members of Congress talk about so fondly reappeared in the Rotunda meeting room of the House Ways and Means Committee. The occasion was an event to honor Rep. Charles Rangel (D-N.Y.), the former chairman of the committee. About 600 people gathered on the floor of the marbled room to watch the unveiling of a portrait of Rangel, to be hung over the room's east entranceway. Hundreds from Rangel's Manhattan district had traveled to Washington by car, train or chartered bus to participate in the event. House staffers ambled in, as did participants in the annual convocation of the Congressional Black Caucus Foundation (Rangel, who has been a congressman for 40 years, is a founding member), which is going on now in the Washington Convention Center a mile away. The large, festive, partisan crowd milled around good-naturedly, chanting "Char-lie, Char-lie" when the once-powerful congressman appeared, beaming in a red tie and blue suit. Some even added the old Arsenio Hall "woof-woof-woof," with fists rotating, no doubt rattling the ghosts of dead Chairmen James Polk, Millard Fillmore and a few others who peered down from framed portraits around the room. Since Rangel's censure by the House 10 months ago, for charges ranging from improper solicitation of funds for a self-named collegiate center and failure to disclose large amounts of income to failure to pay taxes on property in the Dominican Republic, he has lost his chairmanship and been largely thrust out of the spotlight. Even at 80, Rangel had star power. With his dazzling smile and commonsensical way of talking about budgetary matters, he was a popular talking head on evening talk shows. But there are others who are summoned now by MSNBC and CNN to talk about the nation's budget business. But this was an upbeat occasion. The only suspense on Thursday was about what the curtained picture at the front of the room would look like — and whether House Speaker John Boehner (R-Ohio) would show up as advertised. Boehner indeed showed up. After a Harlem reverend spoke of the unveiling of the portrait as "enshrining a great man in this great hall," the speaker stepped to the podium. Would it be more of the same barely disguised partisan ill will, with a withering joke or a perfunctory tribute? Turning to Rangel, he addressed him personally: "I know that we're proud of you, proud of your accomplishments and" — no sense in going overboard — "I hope you have an enjoyable evening." There it was. Not anywhere near as effusive as the remarks of some of Rangel's Democratic colleagues. But Boehner's words were remarkable for their lack of rancor, for their recognition of a political opponent as a personal friend, and they went over well with many in the room. "At heart, most people want to be collegial," said Denise Burgess, a federal planning consultant and a former diplomat, commenting on the spirit of goodwill she was perceiving. "But we've forgotten how to disagree in ways that are not insulting to the other person." Added one former House staffer, a veteran of many House battles: "[Boehner] wants to maintain the integrity of the House, while others are here to tear it down." Boehner and five or six aides left through a door at the back of the room, moving so rapidly it seemed as if they were being sucked out of the room. 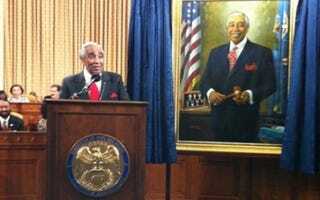 Finally, Rangel's wife, Alma, pulled the drapes away from the portrait to reveal a striking likeness of the congressman standing and holding a gavel. The picture, painted by Silver Spring, Md., portraitist Simmie Knox at a cost of $64,500 (paid for with campaign funds), will probably always be notable for the 150-watt smile on Rangel's face, a challenge to the frowns on the faces in the other portraits around the room. What now for Rangel? Chief of Staff George Henry confirmed the widespread rumor that Rangel will run again next year, for his 22nd term. What's Rangel's legislative program? Henry made a sour expression. "Legislation? There is no legislation. Not in this Congress." Edmund Newton is a freelance journalist based in the Washington area.